U.S. Commerce Secretary Penny Pritzker today announced that four U.S. organizations are recipients of the 2014 Malcolm Baldrige National Quality Award, the nation’s highest Presidential honor for performance excellence through innovation, improvement and visionary leadership. An independent board of examiners recommended this year’s Baldrige Award recipients from a field of 22 applicants after evaluating them in seven areas defined by the Baldrige Criteria: leadership; strategic planning; customer focus; measurement, analysis and knowledge management; workforce focus; operations focus; and results. An organization may compete for the award in one of six categories: manufacturing, service, small business, health care, education and nonprofit (including government agencies). Thousands of organizations worldwide use the Baldrige Criteria to guide their operations, improve performance and get sustainable results. The criteria, which are regularly updated, help organizations reach their goals, improve results and become more competitive by aligning plans, processes, people, decisions and actions vital to achieving ongoing success. More than 30 independent Baldrige-based award programs covering nearly all 50 states. Internationally, the program has served as a model for nearly 100 excellence programs. From 2010-2013, Baldrige Award applicants represented nearly 500,000 jobs, more than $77 billion in revenue and budgets, and more than 400 million customers served. A December 2011 study measuring the Baldrige Program's value to U.S. organizations conservatively estimated a benefit-to-cost ratio of 820 to 1, while a 2011 report by Truven Health Analytics found that health care organizations that have won or been in the final review process for a Baldrige Award outperform other hospitals in all but one metric the company uses to determine its "100 Top Hospitals" in the nation (and were six times more likely to be among the top 100). A study of the six organizations to win two Baldrige Awards found that for the years between awards their median growth in revenue was 93 percent and the median growth in jobs was 66 percent. The job growth was significantly higher than the average growth in jobs of 2.5 percent for matched industries and time periods. 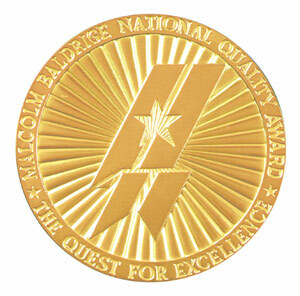 The 2014 Baldrige Award will be presented at an April 2015 ceremony during the Quest for Excellence conference in Baltimore, Md. The Baldrige Award was established by Congress in 1987 and is not given for specific products or services. Since the first group was recognized in 1988, 105 awards have been presented to 99 organizations (including six repeat winners). The Baldrige Program raises awareness about the importance of performance excellence in driving the U.S. and global economy; provides organizational assessment tools and criteria; educates leaders in businesses, schools, health care organizations, and government and nonprofit organizations about the practices of national role models; and recognizes those role models with the Baldrige Award. For more information, including profiles of the 2014 Baldrige Award recipients, go to http://www.nist.gov/baldrige.